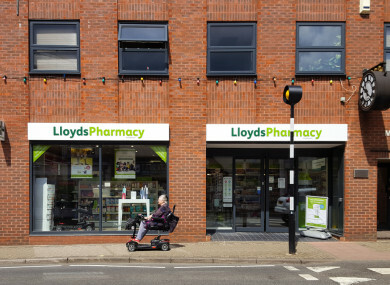 LLOYDS PHARMACY HAS ignored requests to engage in talks with trade union Mandate, which could lead to industrial action by nearly 200 staff. In mid-April, the two parties attended a Labour Court hearing at which the union sought various changes to pay, contracts and annual leave entitlements. Among its demands are the introduction of pay scales, the elimination of so-called ‘zero-hour contracts’, and improved annual leave entitlements and public holiday pay. Mandate – which says it represents 190 workers at the company – told the court that its demands were “no more than what exists” for staff at rival pharmacy chain Boots, which recognises the union. Lloyds Pharmacy, which employs more than 1,000 people at 90 Irish stores, doesn’t recognise Mandate and told the Labour Court it deals with issues around employment terms and conditions through a ‘colleague representative committee’, or CRC. It said that it has a “history of progressive HR practices and direct engagement” with staff, and rejected any comparison with Boots. The court was unable to reach a conclusion on the matter and recommended that the two sides engage in further discussions and try to hammer out an agreement. However, recommendations made by the Labour Court are not binding and the company has not responded to a request from Mandate to arrange a meeting following the decision. A spokeswoman for Lloyds Pharmacy told Fora: ”We note the decision of the Labour Court. Earlier this week, Mandate assistant general secretary Gerry Light wrote to Lloyds managing director Paul Reilly to express his disappointment that the company hasn’t engaged with the union. “We will assume this non-response as confirmation that the company has no intention of complying with the court’s specific recommendation for the parties to engage in order to deal with the outstanding matters contained in the union’s claim,” Light said in the letter. Mandate spokesman David Gibney said the next step in the process will be decided by the workers. “In some instances, they ballot for industrial action. In other instances, perhaps they want to take a legislative approach. All options are open,” he said. Gibney was also critical of Lloyds’ CRC, which he described as a “tiger with no teeth”. Email “Lloyds Pharmacy's refusal to negotiate with trade unionists could spark industrial action”. Feedback on “Lloyds Pharmacy's refusal to negotiate with trade unionists could spark industrial action”.